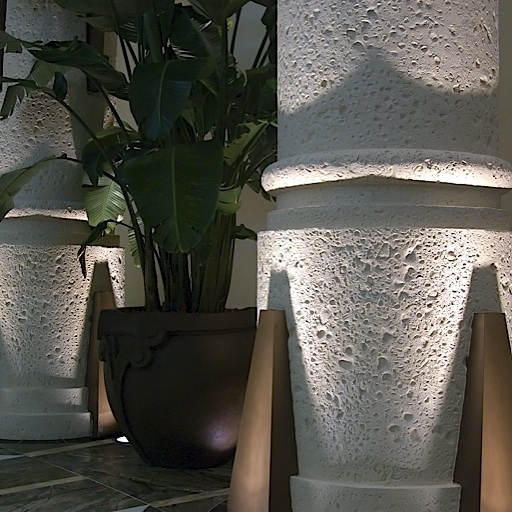 Stromberg coral stone columns featured at the Atlantis Resort. Some of the world’s most beautiful and unique stones can be replicated with the help of some innovative materials. These unique materials offer a way to enhance a building or structure with some stunning architectural elements. Coquina stones are made up of large and small shell fragments as well as sand. Coral stone comes from dormant coral reefs and often contains unique designs and textures that come from the sea. Fossil stones have pieces or imprints of fossils mixed into them. Coquina and coral are often found in oceans like those located off the Florida coast or in Caribbean areas such as Barbados. There are very few of these areas left where these stones can be quarried. Fossil stones can be found throughout the country but are somewhat rare. There is also concern that, since these stones are diminishing, using up natural resources is not beneficial to the environment. For these reasons, Stromberg Architectural replicates these stones and offers a unique look whilst maintaining our natural resources. To ensure that we get the exact look and feel to these unique natural stones, we use real examples as the basis for the casting process. While there are many looks that can be created, according to the detail preference or color choice, the final product is incredible, including an amazing attention to the most intricate details. To help guarantee the right look, we use some of the most flexible alternative materials available today, including cast stone, GFRC, GFRP and GRG. Our talented team has been recognized by museums for their precise and accurate work, especially when it comes to replicating fossilized remains. In addition to accuracy and beauty, the casting process and choice of alternative materials makes the fabricated natural stone much more durable and stronger than the quarried stone. The replicated stones are easier to work with because there is less concern that they will break or become damaged as they are installed along with other architectural features. Because these natural looking stones are fabricated, you can get exactly what you want, potentially reducing the time it takes to complete your project. It also means that you are using an environmentally friendly material for your remodeling or new construction project rather than using up valuable natural resources. Stromberg Architectural is a pioneer in creating innovative architectural products for all types of projects. To learn more about how you could use replicated coral stone, coquina stone, or fossil stone for your next project or to get a free estimate, please fill in our online contact form or call our experienced team at 903-454-0904.